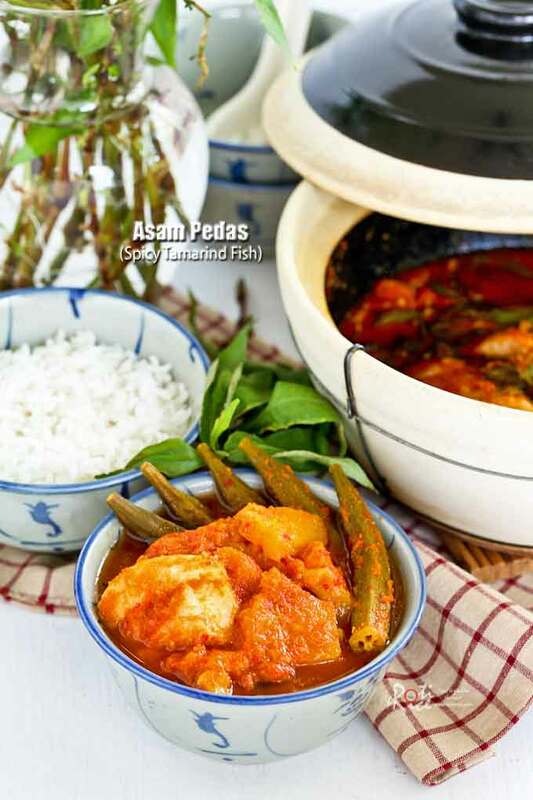 Asam Pedas (Spicy Tamarind Fish) is a spicy and tangy Malaysian fish dish that is sure to whet your appetite. Feast on it with lots of steamed rice. Ask any Malaysian about spicy and tangy curries, two would vie for the top spot. Some would say Asam Pedas while others would swear by Gulai Tumis. A third group thinks that they are both one and the same. To make it even more complicated both of these are technically not curries but forms of spicy soups and gravies. Asam Pedas when translated literally means tamarind spicy. The “tamarind” refers to the tamarind juice used in the gravy. The “spicy” refers to the spice paste which is usually NOT fried in oil. Asam Laksa is a kind of Asam Pedas. Hence, its spice paste is never fried in oil. Gulai Tumis literally means fried spicy gravy. 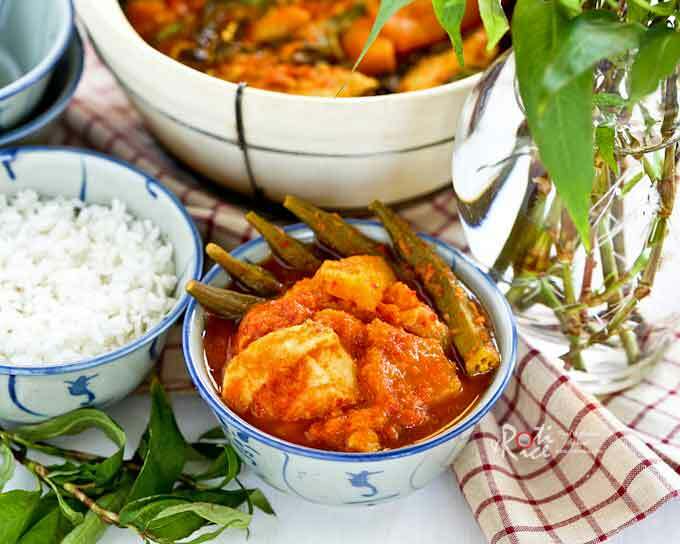 The word “gulai” means spicy gravy and “tumis” means fried. So, in this case, the spice paste is fried and because of that the gravy has a rich oily color. Sorry, but coconut milk is not used in Gulai Tumis. 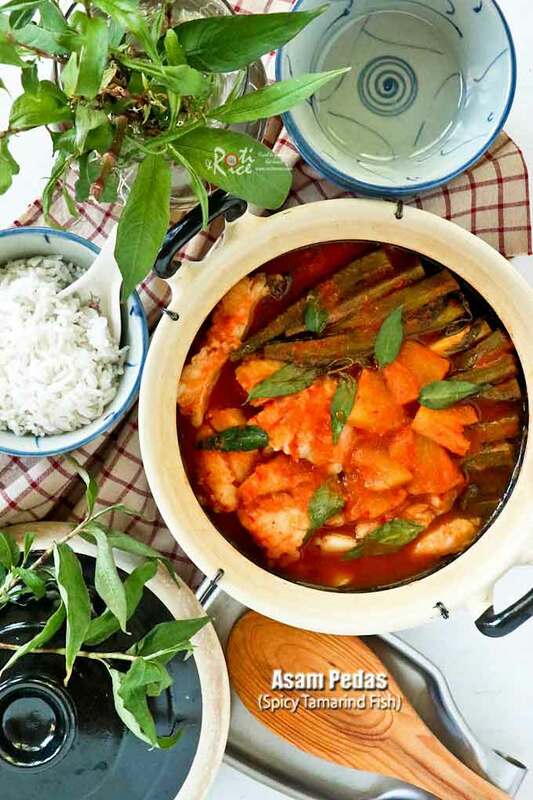 Asam Pedas is very easy to prepare but gathering the ingredients may be a little challenging if you live outside of Southeast Asia. 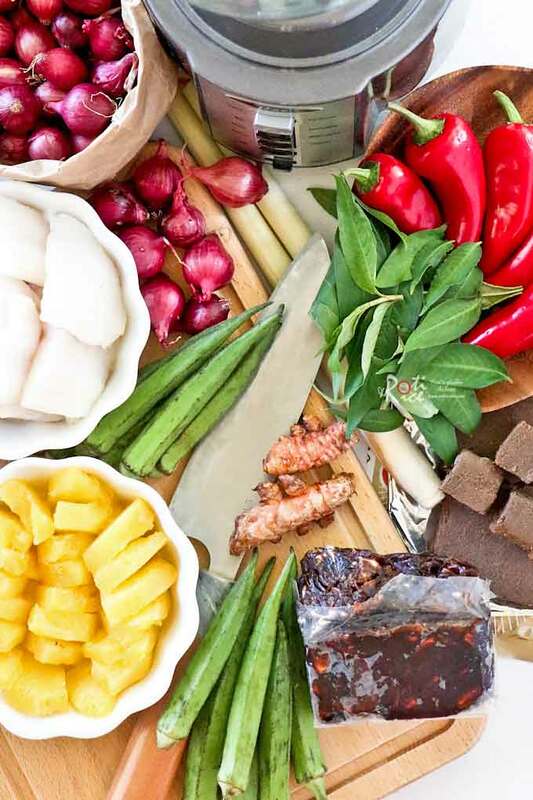 Today, specialty ingredients like lemongrass, asam jawa (tamarind paste), and belacan are available at many Asian grocery stores. Daun kesum (polygonum) a.k.a. Vietnamese mint will probably be the hardest to find. Thankfully, I found the plant last summer at the farmer’s market in downtown Minneapolis. I planted it in a pot and left it outdoors in my Vegetable Garden. When the weather turned cold in the fall, I brought it indoors. At the end of spring, I took it back outdoors and it grew and grew until I had to bring it back indoors just two weeks ago. 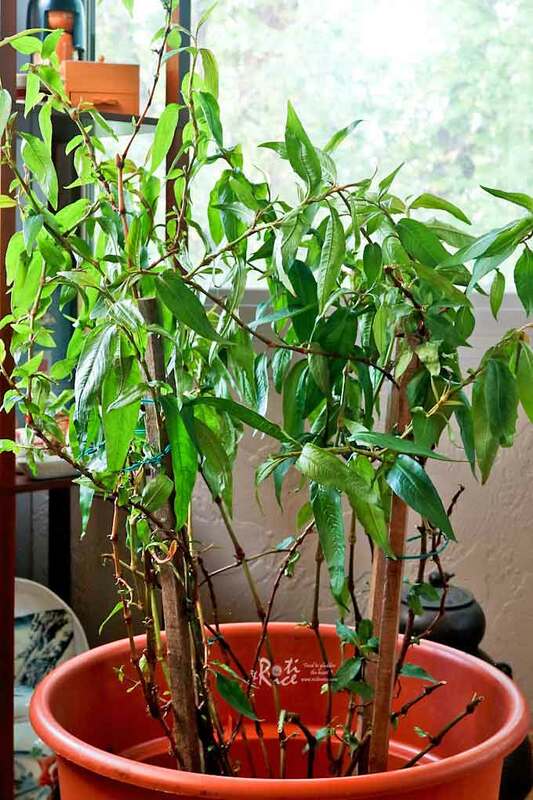 I pruned and re-potted it before moving it to my sun room where it will stay until next spring. I used some of the pruned leaves for this dish. In Malaysia, usually pomfret, tenggiri (trunk mackerel) or kembung (chubb mackerel) are used in this dish. I can’t get either here and so I decided to use cod instead. I am quite happy with the results. Pompano will also work but I did not want to drive downtown to Minneapolis to get the fish this time. Of course, the good ol’ salmon would be delicious as well. You will also notice in the video that I added the sugar only I after I had done a taste test. That was because the pineapple was already quite sweet and so I wanted to be sure that it will not be overly sweet by adding the sugar at the same time I added the salt. Please add both salt and sugar according to your own preference. 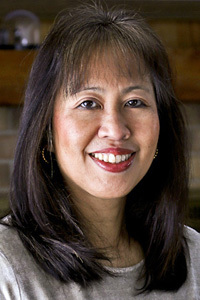 As for the belacan (shrimp paste), it can be toasted or not. If you have good quality premium belacan, you can use it without toasting. I usually toast a large batch of belacan in the summer and store it in jars for use in the winter. Blend all spice paste ingredients with 2 tablespoons water until smooth. Pour spice paste into a medium clay pot or non reactive pot. Pour strained tamarind juice into the pot. Stir to combine. Add crushed lemongrass, daun kesum, salt to taste, and pineapple. Again stir to combine. Place lid on the pot and allow sauce to come to a boil. Reduce heat and continue to simmer for 10 minutes. Remove the lid. Do a taste test. Add a little sugar to taste. Add okra and fish. Place the lid back onto the pot. Continue to cook for another 3 to 5 minutes or until okra is tender. Turn off stove and serve warm with steamed rice. Linda, thanks for sharing this. It’s been many years since I have had the chance to taste Asam Pedas. I do have a question about the clay pot. Do you soak that before cooking? I do not have one at the moment and the ones I see in the local Asian store look very fragile, with the glaze on the inside seemingly uneven. You are welcome! The pots may not seem like the best quality but they do work quite well. I have used them for years. In fact this one that you see above was purchased here more than a decade ago. I use it quite frequently and it has held up. Initially I wondered if I could use it on the electric stove. The only way to find out was to try it and today I use all kinds of clay pots on my ceramic stove. They may scratch the stove and so you have to be careful not to drag the pot across the stove. If you prefer, check out this post for one with a more “modern” look which I purchased about 2 years back. It came with instructions on how to prepare the pot beforehand. Essentially, you give it a thorough washing, then boil a light congee to seal in the pores. Discard the congee. Initially, it would seem like the pot is leaking but after 2 or 3 times of of use, it feels as if the pot have shrunk a little. It kinda becomes lighter and the walls thinner. Perhaps it is because they did not fire the pot sufficiently in the kiln. If you do not want to boil the congee, you have to at least boil some water which is to be discarded one or two times before actual use. Thanks fir the fast response, Linda. I will go to the store and get me one. Have also seen pots that are fully glazed both inside and out. Just have to decide which would work best. Hello! Chanced upon your blog as I scoured the internet researching details on how Assam pedas is made. I’ve never made it before – I’m quite confident in the kitchen but I was always intimidated by the complexity of spices and flavours of Assam pedas. However after coming across your blog, I’m now more keen than ever to try making it! 1. I’ve seen some people steam their fish (esp fish head) first before cooking it but is it possible to fry it before adding it to the gravy? 2. Does gulai tumis use the same spices as Assam pedas? 1. I am not sure why they steam the fish first as that is not really necessary. Frying the fish will make the gravy oily and it will come out more like gulai tumis instead of asam pedas. 2. Gulai tumis uses basically the same spice ingredients but my mom adds a few more spices. I will share the recipe one of these days.